The complexities of the education field require ongoing training on risk management considerations. Whether a crisis affects large groups of traveling students or a single person abroad, Crisis Management for Education Abroad, will help you build core competencies in crisis management and risk assessment, such as collaborate with relevant campus offices: establish informed emergency protocols; develop health and safety materials; and respond to international emergencies. The checklists included in this publication are designed to assist the reader in developing a response plan for prevalent crises. Download these sample checklists and keep them in a safe, convenient location in preparation for a crisis. 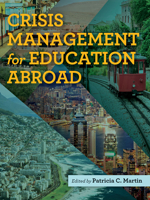 For more checklists and detailed analysis of crisis management in education abroad, purchase Crisis Management for Education Abroad today. To learn more and check out other related resources, visit: www.nafsa.org/eahealthandsafety. Learn more about the work of NAFSA’s Health & Safety Subcommittee and its members.